Twenty-six acre, steeply wooded ravine garden falls 200 feet from the eighteenth-century house down to the beach & river. Glades of huge sub-tropical tree ferns and palms mingle with giant gunnera, furcraea and echium, and over all is the great rolling canopy of 100 year old rhododendrons and a multitude of trees and shrubs with everchanging colour and scent. Trebah, one of the ‘Great Gardens of Cornwall’ and part of the ‘Eden Trail’ is rated among the 80 most beautiful gardens in the world. This lovely wild sub-tropical ravine paradise winds through huge plantations of 100 year old giant tree ferns, rhododendrons, magnolias, camellias, palms and 2 acres of massed hydrangeas to the private beach on the Helford River. 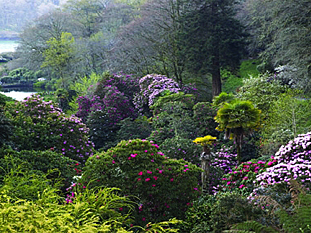 The steeply wooded ravine garden falls 200 feet to the Helford River. A stream cascades over waterfalls through colourful water gardens and ponds of Koi Carp, and winds through two acres of blue and white hydrangears before spilling out over the private beach. Glades of huge subtropical tree ferns, palms and 18 foot high Gunnera mingle with a multitude of trees, shrubs and 100 year old rhododendrons to give Trebah vistas of ever changing year-round colour and scent. The garden was planted in the 1840’s by Charles Fox. By the 1930’s it had acquired a unique collection of the rarest and most exotic plants gathered from all over the world. In 1939 the estate was sold and suffered from 40 years of neglect. 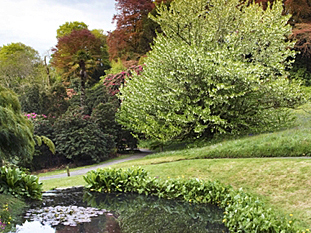 The Hibbert family bought Trebah in 1980, and began a massive restoration and replanting programme. 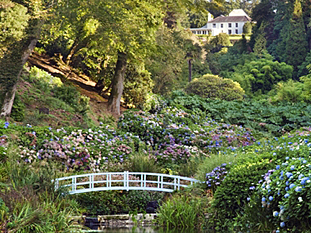 They opened it to the public in 1987, and in 1990 donated it to the Trebah Garden Trust, a registered charity, to ensure that it will remain open for everyone forever. From Truro/East: Take the A39 to Falmouth as far as junction with A394 at Treliever Cross Roundabout, and then follow brown and white tourism signs to Trebah Garden. From Helston/West: Take the A394 to Falmouth as far as junction with A39 at Treliever Cross Roundabout. Turn right and follow brown and white tourism signs to Trebah Garden. SatNav Advice: If you are using a Satnav, we recommend you do not go off into the countryside, some roads are difficult to navigate and not signposted. Stick to the main roads and specified routes, especially when travelling from Helston/West and The Lizard.